We spent the day at the Atlantis Resort, Nassau, Bahamas. We had so many wonderful adventures there- check out our post here to catch up about the great waterpark and dolphin excursions. After all the fun we caught up with some of the princesses before dinner. We ate at the Animator's Palate for dinner. The best restaurant on the boat!! I wish we would've had more than one night there, but that was just how the schedule worked out. The tables are set up so the kids are able to face the screens. And it was so fun because they have Nemo and Dory putting on a show with games, etc. Then you get to hang out with Crush- he is a riot! He and my husband had a couple different conversations and it was hilarious. We didn't catch the first one on tape, but we got one of them when Crush was talking to my little girls about my husband. It was great. The food was spectacular. Our server was so amazing to prep me the night before to let me know the beef would be really good tonight, so I already knew what I was getting. Everyone loved it. The butter knives were super cute. They looked like little paint brushes, and I bought one to bring home. I LOVED the Black Truffle Pasta. The butternut squash soup had nice flavor and a very smooth texture. The star of the night was the Beef Tenderloin with the Wasabi Mashed Potatoes. Wow!! Those were amazing!! I had the cheesecake for dessert, but I had a few bites of my daughter's cookies and cream sundae, and that was a much better pick. Delicious!!!!!!! The kids were so exhausted by dinner time. Look at our sweet tiny cousin- so exhausted she fell asleep at the table. One of the waiters was really sweet and pulled up an extra chair to make her a little bed! Our entertainment after dinner was Disney's Believe. It was a fun musical, the kids loved it. I ended up in the hall with the crazy toddler for a lot of it. Poor guy has been very nap deprived this trip. The entertainment has been fabulous. The big kids were still running around doing different things on the boat and we were bringing the little ones to bed, when Mia (3) asked us when we were going to get on the boat. We told her we were on the boat. But she insisted we had been on this trip for days and still hadn't been on a boat. We were flabbergasted! She wouldn't believe us! Ha! Ha! So, I decided we needed to have a little date up to the top deck to show her. Mia and I, headed up to deck 11, where the pool area is and looked out into the ocean. Unfortunately, it was pitch black out there, and she couldn't really see much. But I think she finally believed me. We grabbed and ice cream cone and chatted about our day. She is the sweetest little thing, and it was so fun to have a little one on one time where she felt like a big girl staying up with mama. It was the perfect way to end a magical day. 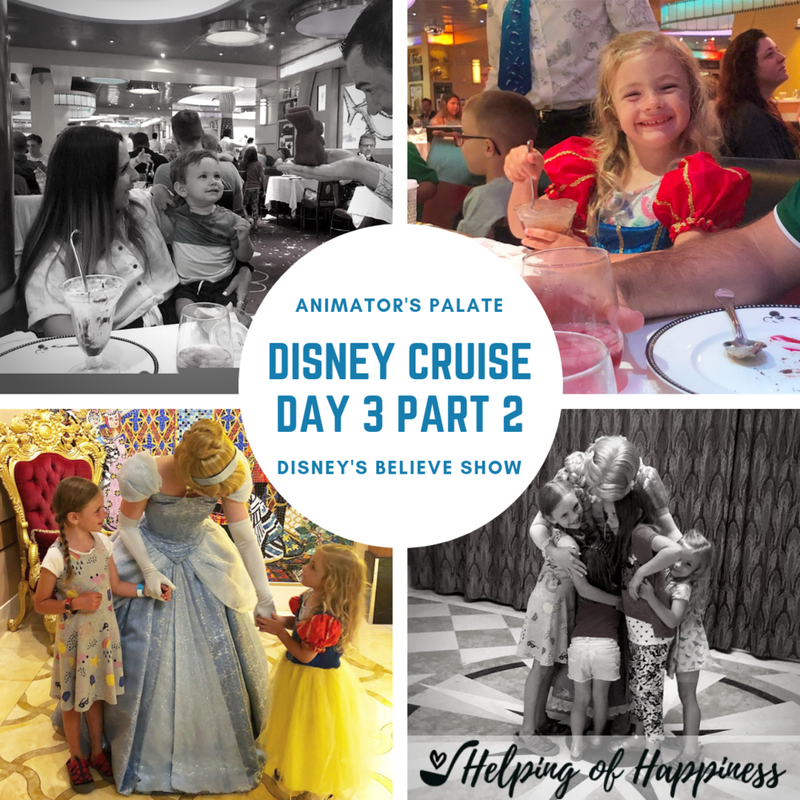 Check out our other Disney Cruise adventures! !